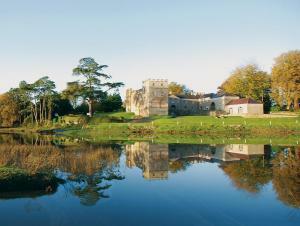 Choose from 25 hotels and guest houses in Dyfed. Shown below a just a selection of the hotels available. To search within an area please use the menu on the right. Newport Links Golf Resort - Ideally located within easy reach of the town of Newport, this 4-star hotel has stunning views looking out to sea from the heart of the spectacular Pembrokeshire Coast National Park. Nestled within the superb scenery of the Carningli (or mountain of the angels), on the Nevern estuary, the hotel is a great base for a relaxing break. During your stay, you can enjoy a round of golf on the outstanding 80-year-old golf course, go salmon fishing on the best river in Wales or simply walk the best coastline in Britain. In addition to this, the hotel is only 15 minutes from the port of Fishguard, which takes you directly to Ireland. Newport attracts all kinds of people, from walkers, bird watchers to golfers and fishermen. With its arts and crafts shops and extremely friendly Welsh pubs, Newport has everything. The hotel's friendly staff will endeavour to help arrange the perfect break for you. Slebech Park - Set in an unique waterside environment, Slebech Park is a beautifully secluded country estate that offers peaceful, luxury accommodation in the Pembrokeshire Coast National Park. Slebech Park is in the middle of a 600-acre private estate. It has a serene and informal atmosphere, excellent Welsh hospitality and rooms with a simple, chic decor and countryside views. Slebech Park sits on the edge of a tranquil tidal estuary and is well located for the coast path, stunning beaches, Norman Castles and St Davids Cathedral. For dining, The Park @ Slebech has a good reputation and stunning views. It serves local produce, including vegetables from the extensive kitchen gardens. Splendid views and log fires can be enjoyed in the bar. Elm Grove Country House - In a beautiful, tranquil location, nestled amongst acres of lawns and fields, this charming 4-star country house has been run by the Rees family for 50 years. This elegant Georgian house has an idyllic setting in its own delightful grounds in the picturesque village of St. Florence, 3 miles from Tenby. During your stay, you can explore the interesting village inns, historic Flemish chimneys and enjoy the peaceful setting of this colourful, fragrant village, which has blossomed into one of the foremost floral villages in Britain. The historic building boasts plenty of period charm and beautiful original features, including marble fireplaces, panelled doorways and large picture windows. All of the attractive, individually decorated rooms are en suite and include bathrobes among all other excellent modern facilities. Llety Ceiro Guesthouse - Set within a converted farm building, this relaxing countryside retreat is immersed within the peaceful surroundings of the picturesque Eleri Valley, Cardiganshire, making it the ideal base for walkers, bird watchers and cyclists. Llety Ceiro offers 10 comfortable en suite rooms, each of which is equipped with all you may need for a relaxing and memorable stay. It also features space for your private functions, a fully licensed bar and a stylish new restaurant serving traditional home-cooked meals. Conveniently situated to explore both North and South Wales, Llety Ceiro is just 4 miles away from Aberystwyth and 2 miles from the seaside resort of Borth Llety Ceiro. You can even take one of the guesthouse's bikes to explore the beautiful surroundings. 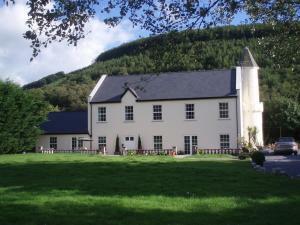 Glangwili Mansion - On the edge of the Brechfa Forest, in the beautiful yet largely undiscovered Gwili Valley, this luxurious bed and breakfast has 3 individually designed rooms with flat-screen TVs and DVD players. Glangwili Mansion has a beautiful, peaceful location, ideal for walkers and cyclists and for those wishing to visit the many visitor attractions of Carmarthenshire and Pembrokeshire. Now carefully renovated and lovingly restored to its former glory, the Glangwili Mansion has 3 individually designed en suite rooms, each with its own unique character and charm. Every room has a large en suite bathroom, luxurious beds and original modern art on all the walls. All of the rooms have soft, fluffy dressing gowns and slippers, flat-screen TVs with DVD players and seating areas. Tea/coffee making facilities, flasks of iced water and hair dryers are standard in every room. A full cooked breakfast is included in the price and free Wi-Fi is available in the public areas. Seabreeze Guest House - Seabreeze has an idyllic seafront location in the old fishing port of Aberdovey. 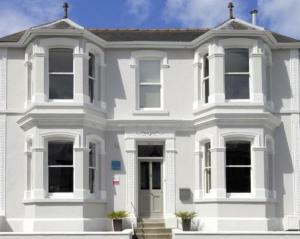 It offers central, seafront bed-and-breakfast accommodation with views over the beautiful Dovey estuary. Seabreeze offers modern, relaxing en suite rooms with powerful showers and fresh, crisp linen. Enjoy breakfast in a friendly and informal manner. Aberdovey is the perfect base from which to explore Mid and North Wales. Fronlas - This beautifully renovated Edwardian town house is now a 5-star bed and breakfast offering stylish boutique accommodation, free Wi-Fi and stunning views of the Towy Valley and the Brecon Beacons. In the colourful market town of Llandeilo, in Carmarthenshire, West Wales, Fronlas is an eco-friendly bed and breakfast on the fringes of the Brecon Beacons. With just 3 individually styled rooms, it combines the contemporary designer looks of a boutique hotel with the personal touches of a luxury bed and breakfast. All of the en suite rooms have Sony flat-screen TVs, DVD players and magnificent views of the beautiful surrounding countryside. The beds feature crisp organic linen and luxury organic mattresses by Abaca. All of the natural stone bathrooms feature soft, fluffy bathrobes, and luxury toiletries from the White Company. Every bathroom has a rainwater shower and some have baths. The full English breakfasts are made using fresh, organic produce, locally sourced wherever possible. 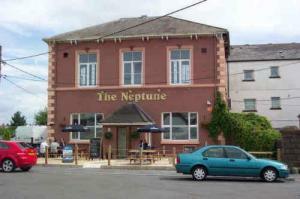 The Neptune - Superbly located opposite the harbour and seafront, The Neptune offers comfortable accommodation, next to Burry Port Train Station and close to Millennium Coastal Park. All of the contemporary, stylish rooms are well furnished, with en suite facilities and a TV. Some rooms have stunning views of The Gower Coast. . The Neptune boasts a cosy, welcoming bar and an attractive garden, with an outdoor seating area. Locally sourced food is available from the extensive menu and an inclusive breakfast is provided. Local attractions include Burry Port Marina, Pembrey Motor Racing Circuit, Pembrey Country Park, Ashburnham Golf Club, and Cefn Sidan Beach. The nearby coastal cycle track is an ideal way to explore the beautiful countryside and coastline of Carmarthenshire and Pembrokeshire. Free parking and free Wi-Fi internet access are available to guests. The Ferryboat Inn and Restaurant - Offering quality en suite rooms and forecourt parking, 500 metres from Fishguard ferry port, this is the nearest accommodation provider to Europcar and Hertz car hire, ideal for visiting Pembrokeshire. The 4-star Ferryboat Inn & Restaurant is ideally located to offer a relaxing break for those travelling to and from Ireland and is a wonderful base from which to enjoy the beautiful unspoilt Pembrokeshire coastline and countryside. The restaurant and bar have also been fully refurbished in March 2007, with the addition of a new Guest Lounge. Southmead Guesthouse - Southmead Guesthouse has a good location between Llanelli town centre and the new Millennium Coastal Park. It is within 10 minutes' walk of the local train station. The Southmead is convenient for Carmarthen and Swansea and is close to Llanelli College and the hospital. Llanelli has many pubs and great places to eat in, as well as fun activities like paintballing and horse riding. There are also some unique fishing spots.